Trauma-focused cognitive behavioral therapy (TF-CBT) is regarded as one of the most effective treatments for children who have experienced trauma and is rapidly being disseminated. To best ensure efficacy, even among treatment refractory symptoms, a better understanding of the factors that lead TF-CBT to be more or less effective for some children is warranted. One major factor that has not been systematically considered is the role of caregiver psychopathology. Therefore, this systematic review of 18 empirical studies examined how TF-CBT has incorporated caregiver psychopathology into the treatment of childhood trauma and how it is related to treatment outcomes. 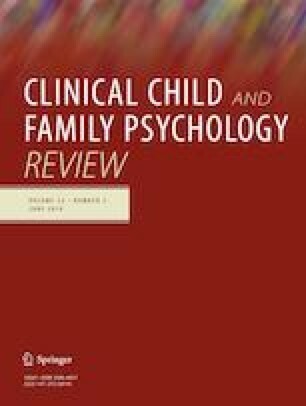 The results of this review provide preliminary support for TF-CBT decreasing caregiver psychopathology, in terms of symptoms of depression, PTSD, and emotional distress related to the child’s experience of trauma, as well as partial support for caregiver depression, rather than caregiver PTSD or distress, influencing child treatment outcomes. It also illuminates the strong need for future TF-CBT studies to routinely measure caregiver psychopathology. Several recommendations are provided to ensure that the emerging research base can inform clinical practice guidelines on how to incorporate caregivers who exhibit psychopathology and potentially develop modifications to the existing treatment to address trauma and symptoms in both members of the caregiver–child dyad, when needed. We are grateful to Carole Swiecicki for providing helpful feedback to an earlier version of this manuscript. All study authors declare that they have no conflicts of interest.